Dwarikesh Sugar Industries Ltd is in portfolio of Anil Kumar Goel. He is one of the top investors in India. The company belongs to Sugar sector. As per the Company website it is a Sugar Company expanding its foot print in different related business areas like Ethanol.It ha four plants all located in state of UP. UP is leading Sugarcane producing state. So location of plants in state gives it advantage of having raw materials close to the factory. The Company generates power for internal consumption. This helps it decrease operational cost as well as generate extra revenue by selling the extra power generated. It is also engaged in the development of sugarcane breeding stocks to enable high sugar production. It is helping farmers increase per hectare production of Sugarcane which will help Company get raw materials in near vicinity. It is win win situation for both farmers and Company. The stock got listed in year 2004 at listing price of 13 INR. The Company struggled after making debut on stock exchanges. It went downhill soon after listing. From year 2006 to 2015 the stock slowly moved from double digit to single digit (2 INR). People have lost good amount of money in the Counter as well. It is only in year 2016 it zoomed and touched around 70 mark giving close to 35 times return to investors in short span of time. Sugar stocks being cyclic are unpredictable. Those who invested in year 2015 or so make huge money in short span of time. But many have lost money in the counter as well. 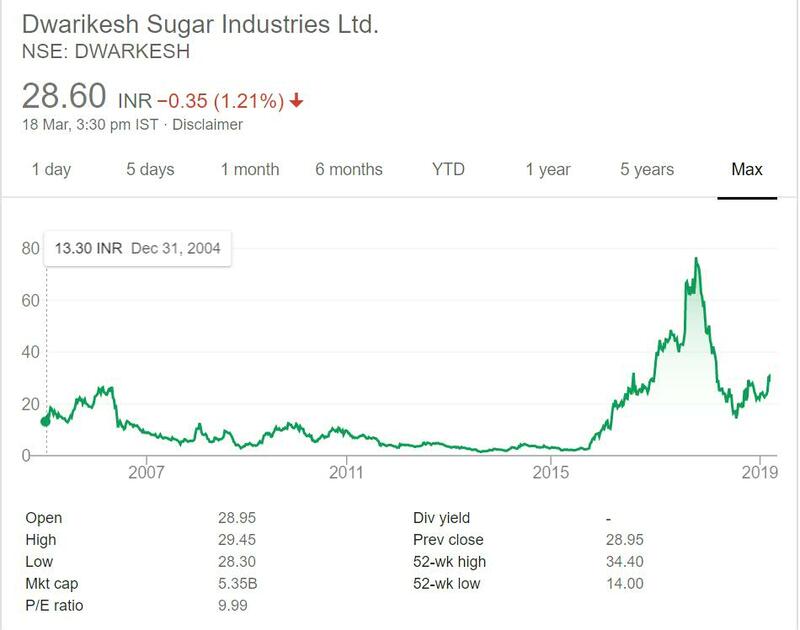 Dwarikesh Sugar Industries Ltd is a Sugar Company. This is one of the Sugar companies in which ace investor Anil Kumar Goel has invested. He has more than one Sugar Company in his portfolio. As mentioned in previous articles on Sugar sector this is cyclic sector. The prices rise and fall very fast. People should be careful to enter and exit the stock. If you can time the entry and exit then you can make money. This is hard to practice and perfect. Sugar stocks are swing trading stocks you can not invest and hold them for long term. I personally do not like the sector as timing is very important. I am not invested in this sector and not planning to take exposure in it.